Qualified SEC defined accredited high-income investors can deduct 100% of their intangible drilling costs (IDC) against all forms of federal and state income. This typically results in an estimated 40 - 50% tax savings in the first year. Investors who participate this year can take their deduction in 2017. 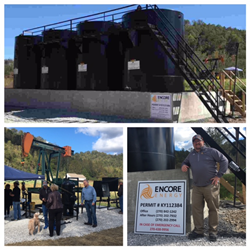 Encore Energy, Inc. is currently testing its first horizontal Berea well and making plans to drill three (3) immediate horizontal wells with five (5) additional horizontal Berea prospects planned in Lawrence County. The Berea play in Eastern Kentucky represents more than 20% of the state's annual oil production with the lion's share of this crude production coming from Lawrence County. Tax Savings Example: Assuming a federal tax rate of 39.6%, state tax of 10% and a 95% first-year intangible expense allocation, your typical investor could receive $95,000 in deductions and $47,120 in tax savings, in the first year alone, from a $100,000 investment. Oil and gas investments involve a high degree of risk and are suitable for investors who can afford the loss of their entire investment. Encore Energy, Inc. does not provide tax advice, and prospective investors should seek advice from their tax advisor(s). Assumptions, Disclaimer and Cautionary Statement: The information herein may contain forward-looking statements, and actual results may vary. Words such as "estimate", "will," "intend," "continue," "target," "expect," "achieve," "strategy," "future," "may," "goal," or other comparable words or phrases or the negative of those words, and other words of similar meaning indicate forward-looking statements and important factors which could affect actual results. Forward-looking statements are made based upon Management's current expectations and beliefs concerning future developments and their potential effects upon Encore Energy, Inc. Oil and gas investments involve a high degree of risk, uncertainty and are only suitable for qualified Accredited (SEC Definition) investors who are sophisticated in making business decisions and can bear the financial loss of their entire investment, while delivering a turnkey profit to the Company for proving the prospect development, lease acquisition, drilling, completion, engineering and ongoing production operations. The Company does not provide tax advice and investors should seek the advice of their tax professional. Any tax and/or other information herein is provided for illustration purposes only and may include estimates that are uncertain and subject to change. It is impossible to accurately forecast profitability, production, reserves, income, expenses and timelines for any project. No assurances can be made as it relates to reserves, production, income, profit, prices, timelines and/or other estimates. Actual production and results are beyond the control of management. In the event that commercial production is achieved, it may take many years for the investor to recoup his or her investment. The Company's lease acreage position under is subject to change and includes acreage under lease, Farmout agreement, verbal agreement, renewals, expired terms and any other prospective acreage in which the Company has communicated and/or negotiated with the landowner the leasing of oil and gas rights, now or in the future, and the lease / mineral owner has leased or communicated their intent to lease there mineral lease rights to the Company. It is important for qualified investors to acknowledge the fact that the US government provides them with tax savings (100% IDC tax deduction) to mitigate or at least off-set some of the financial risk associated with domestic oil and gas investments. This is not an offer to sell or buy a security. An offer shall only be made pursuant to SEC Regulation D, Rule 506(c) by a private placement offering memorandum which further governed by the National Investment Securities Marketing Improvement Act of 1996. This is not a private placement offering memorandum.